It may be sexist to describe Spottswoode as a feminine style of Napa Cabernet, but from the start, there has been no arguing with the fragrant elegance of this midweight wine. 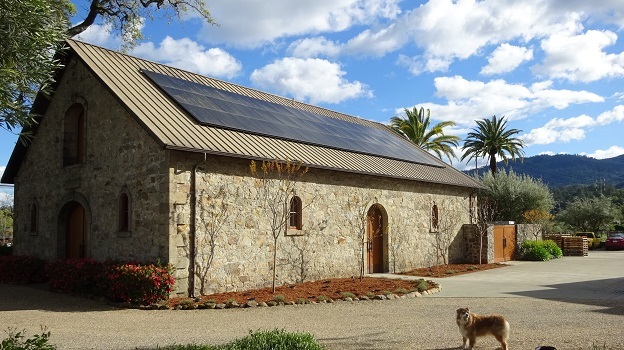 And in fact the modern history of the estate has been dominated by women, beginning with owner Mary Novak and her daughters Beth and Lindy but also including a string of talented winemakers: Pam Starr, Rosemary Cakebread and Jennifer Williams. The Spottswoode property dates back to 1882, when George Schonewald, a German immigrant, planted 17 acres of wine grapes on a 31-acre parcel in the community of St. Helena, with the intention of using the estate as a summer home. He named it Esmeralda. Two years later, Schonewald sold several acres of adjacent land to Frank Kraft, who built a Victorian farmhouse for his family as well as a stone wine cellar that the Novaks eventually renovated in the 1990s. After the death of his wife in 1906, Schonewald sold his Esmeralda estate to Joseph Bliss, who renamed the estate Lyndenhurst (the name the Novaks use today for their second wine, made from the estate’s youngest vines). Bliss sold the estate to Dr. George Allen two years later and Allen in turn sold it again in 1910 to Mrs. Albert Spotts. Mrs. Spotts renamed the property Spottswoode in memory of her late husband. With the threat of Prohibition looming, the Spotts family planted their vineyard to a field blend of Green Hungarian, French Colombard and Petit Sirah; but the estate fell into disrepair during Prohibition, and the Spotts family survived chiefly by selling grapes to the Christian Brothers Winery for their sacramental wine. In 1930, Mrs. Spotts, who had no descendants, gave the Spottswoode Estate to her niece, Florence Holmes, and Florence’s daughter Constance Price, who used Spottswoode as their second home (they lived in Berkeley). Following the repeal of Prohibition at the end of 1933, Spottswoode began to sell fruit to the St. Helena Wine Cooperative, at that time controlled by Gallo. In 1972, Dr. Jack and Mary Novak purchased the 31-acre Spottswoode Estate and moved their family of five children to St. Helena. The Novaks immediately purchased an additional 15 acres of bordering farm land, increasing the estate’s total acreage to its current 46 acres. The following year, they decided to replant their pre-Prohibition vineyards, located on well-drained alluvial soils, to Cabernet Sauvignon, Zinfandel and Sauvignon Blanc using AXR rootstock. After Jack Novak died suddenly in 1977, Mary Novak decided to pursue the family’s winemaking venture, taking over management of the estate, finishing her first harvest, and selling the fruit to various Napa Valley families, including the Shafers and the Duckhorns. In 1982, exactly 100 years after the estate’s beginnings, Mary Novak officially founded the Spottswoode Winery and produced its first Cabernet Sauvignon, with consultant Tony Soter serving as winemaker. From the beginning, the wine came entirely from estate vines. Soter quickly T-budded the estate’s nine acres of Zinfandel over to Cabernet Sauvignon, Merlot and Cabernet Franc but never used the Merlot in the blend and eventually ripped it out and replanted the vines to other varieties. There are now 37 acres planted on the estate: 1 of Sauvignon Blanc, 1 of Petit Verdot, 4 of Cabernet Franc and the rest Cabernet Sauvignon. The Spottswoode vineyard is essentially the northernmost part of the western benchland of Napa Valley, which begins around Dominus in Yountville and includes Oakville and Rutherford. The soil is all of the same Bale Clay-Loam Series, but with important differences within the vineyard, which sits on the western edge of St. Helena at the convergence of two creeks. The Novaks refer to the back of the vineyard, at the foot of the mountain, as the “gold coast,” with its alluvial soil, while toward the house and winery the soil is richer in clay. Closer to town, the alluvial soil has a strong influence of an old river, with more cobble and rocks. Soter, who also took over management of the estate vineyard in 1985, introduced the concept of organic farming at Spottswoode. At roughly the same time, Mary Novak’s youngest daughter Beth took over as general manager (she became president and CEO in 1998 and also served as the first female president of the Napa Valley Vintners Association that year). During Soter’s years at Spottswoode, the fruit was custom-crushed at a number of facilities. From the start, the Spottswoode Cabernet has been aged in about 60% new oak, initially all Nadalié barrels with what the estate called SHT (Soter heavy toast), and bottled during the second summer after the harvest. Over time, Spottswoode has added several additional coopers, primarily Sylvain, Taransaud and Darnajou. The wines in the ‘80s and early ‘90s were all from the vigorous AXR vines, which set larger crop loads and struggled to achieve “huge ripeness,” in the words of Beth Novak Milliken. The 8-by-10 vine spacing and the “California sprawl” gave good leaf coverage to the grapes. In a recent email exchange, Soter told me that despite the warmth of the site (St. Helena is generally warmer than Oakville and Rutherford, in part because the fog from the south rarely reaches it), the pH of the Cabernet fruit during his years at Spottswoode was “remarkably low.” He explained that “the early termination of active growth typically shifted the vine physiology such that excess malic acid was metabolized in the process of respiration” and the result was “a more stable pH due to a better ratio of tartaric to malic acidity” (i.e., the pH barely changed during the malolactic fermentation because there was so little malic acidity to begin with). Soter insisted that acid additions were rarely necessary in the early years (Beth Novak told me that the first two vintages were acidified but that Soter quickly pulled back on acidification after that). But he pointed out that now that the vineyard has been replanted with different rootstocks, that may no longer be the case. Indeed, Rosemary Cakebread and Beth Novak both told me that at least minor acidification is needed in the warmer years, with Cakebread specifically mentioning vintages 1997, 2002 and 2004. In 1989, the Novaks purchased the historic Kraft property adjacent to Spottswoode and began to restore the pre-Prohibition home and old stone winery, the latter to be used as their second-year barrel cellar and the Victorian home as Spottswoode’s business office. In 1992, the same year they received organic certification from the California Certified Organic Farmers (CCOF), Spottswoode began an extensive replanting program for the AXR vines lost to Phylloxera, at the same time replacing acreage devoted to Sauvignon Blanc with Cabernet Sauvignon. (Through vintage 1996, Spottswoode was made entirely from vines on AXR.) Spottswoode introduced a number of different rootstocks and tightened up vine spacing: 5 feet by 7 feet is now typical here, with some sections of the vineyard planted at 6 by 8. Soter was especially intent on getting dappled light on the fruit, in order to protect it against strong direct sunshine and to prevent sugar accumulation from outpacing phenolic ripening, which is a challenge in this warm area. Pam Starr took over winemaking duties in 1992, with Soter continuing as consulting winemaker (Soter’s associate Mia Klein, who established her own Selene label in 1991, also had an important role at Spottswoode beginning in 1989.) Soter and Klein maintained their relationships with Spottswoode through 1997, when UC/Davis graduate Rosemary Cakebread was hired as winemaker, with Starr leaving to start her own Crocker & Starr project. Cakebread, who now makes wines under her own Gallica label, made vintages 1997 through 2005. By 1999, the Novak family finished construction of their new winery and crushed their first vintage in it. Jennifer Williams , who had joined Rosemary Cakebread as winemaking assistant in 2003 and was appointed as vineyard manager in 2004, took over as winemaker in time to make the 2006, the estate’s 25th Anniversary Estate Cabernet Sauvignon, with Cakebread staying on in a consulting role. Aron Weinkauf was hired as assistant winemaker that year and took over as winemaker from Williams in 2011. 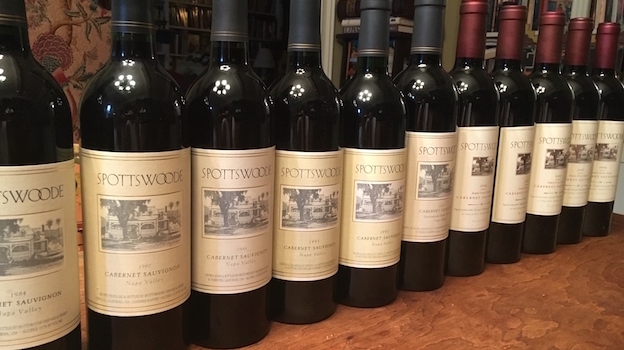 From the outset, the Spottswoode wine has been a distinctly graceful style of Napa Valley Cabernet, particularly in light of its very warm site (I recall describing one of the early vintages as “boysenberry juice for grown-ups”). The wine has always led with its dark berry flavors and frequently shows a floral element, possibly from the Cabernet Franc component, which has variously been described as lavender, dried rose and violet. The Spottswoode Cabernet has never been a full-blown, superripe wine. In fact, it wasn’t until 2000 that a Spottswoode Cabernet was bottled with 14% alcohol and to this date it has exceeded 14.5% only once, in 2002. Still, some hot vintages in the first half of the 2000s, particularly the 2004, motivated the winery to purchase a sorting table in 2006 (the better to eliminate dehydrated or underripe berries) and Spottswoode added a much more precise optical sorter in time for the 2014 harvest. According to Novak, since Weinkauf took over winemaking duties, Spottswoode has been picking earlier than they were during the Williams years, looking for greater freshness rather than more ripeness. Harvesting has also become more precise, with the vines planted on clay-rich soil usually picked earlier, as their root systems are less deep. Sometimes the “afternoon side” of the vines (i.e., the more west-facing vines that receive hot afternoon sun) is picked at a different time than the morning side. Recent vintages here have been consistently outstanding; in addition to his talents as a winemaker, Weinkauf has had the good luck to be working with maturing vines: the vines replanted in the ‘90s are now 19 to 24 years old.